Last night in the semifinals of the FIFA Under-17 World Cup, Mexico gave notice and fired a figurative shot across Soccer House's bow when Julio Gomez, head wrapped in gauze, scored the goal that gave Mexico the 3-2 win over Germany with the lovely bicycle kick shown in the video below. The young German squad, which had knocked out the United States in a 4-0 victory during the Round of 16, took an early 2-1 lead, but then, in the 75th minute, Jorge Espericueta picked up the equalizer on an improbable corner kick (you can watch it in the second video below). 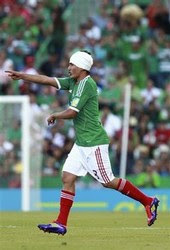 Finally, in the 89th minute, Julio Gomez, who suffered a head wound earlier in the match during a collision with a German player, picked up the game winner, sending Mexico to the final, where they will face Uruguay. After the beating that the Mexican senior squad gave the United States senior squad in the recent CONCACAF Gold Cup final, Soccer House should be worried about its place in CONCACAF, past dominance means nothing if you allow it lead you to stagnancy, and, right now, Soccer House looks like a stagnant, scum covered bog when compared to the Federación Mexicana de Fútbol Asociación.